However, if you want to make your search listing stand out, you can shift your focus to semantic SEO in Sydney. Semantic search is a process that receives meaningful results, even if the produced items would not have any query terms. And Google is a semantic search engine. It provides users with the pages they mean to look for, based on the connotation of their search rather than the mere words. You need to make sure that your content is optimised to serve the true intent of the users. Semantic SEO is an activity of giving more depth to the words you utilise in your content. Once you have offered answer for a simple query, you have to answer the second, third and fourth questions immediately that comes after that. This would give more strength to your content and you could become a valuable asset to the Google. Thus, you would have a chance to stay in the top for a longer period. You might wonder that the keyword ranking is something that is not sustainable. But remember that you can retain the “traffic” for a longer time frame. An SEO company in Sydney would initially figure out “exactly” why the users are looking for something and place those elements strategically around while building contents. You can obtain hints from what is presented by the Google in the “related search” and “people also ask for” section, and resume your content by providing solutions to those. 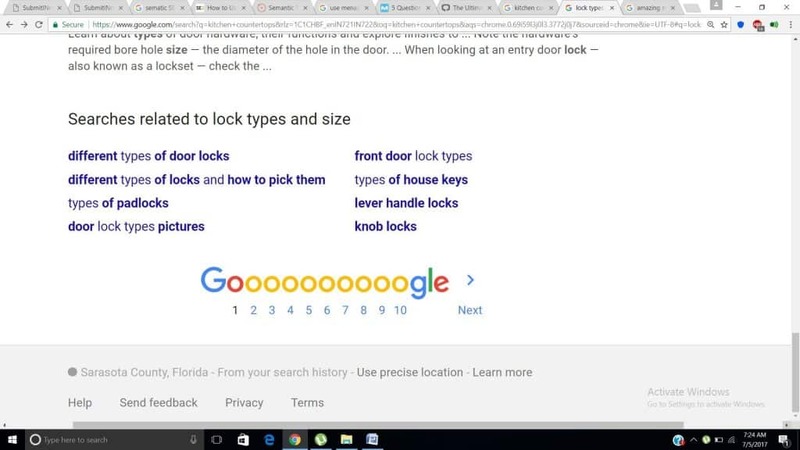 Have a traditional search for a broader term, say “locks”. When you are looking for locks, you would also want to know about the different types available and their sizes. Wouldn’t you? You can obtain such semantic information from the Google. Look at the “searches related” box as it would offer ideas to build a complete content. Now it is easy to assume the intent of the customers. It is astonishing to secure the topmost place in the organic search, but even more so to get an opportunity to appear above the “position 1”. Features snippets are usually accompanied with an image and a larger text. Once they appear, the users would not even bother visit the website that is ranked “number one”. The experts of SEO in Sydney claim that you can use the SERPs to your own advantage here. When you click on the related searches, it would generate different search pages. For example, consider three different “related search queries” given in the example above. Three different queries and the same detailed answer! The reason is this featured snippet has more accountability when compared to the others. This clearly shows that by thinking about the next questions your users would come up with and providing the most relevant answer, you can receive higher ranking.